The Yowza Navarre Elliptical trainer has an excellent stride length of 20”, making it comfortable for even tall users. The elliptical motion is reversible, smooth and quiet and pedals pivot for optimal comfort. Maximum user weight is hefty 331 lbs and the Yowza Navarre is built sturdy enough to handle big folk. Foot pedals are designed to keep your stride in the most comfortable position during workouts and upper body handle bars provide for a total body workout. The display is backlit for easy reading, even in low lighting conditions. You can choose from 12 different programs and the unit can store the profiles of up to 9 different users. You can monitor your heart rate 2 ways, with the contact grips or by using a wireless heart rate strap. There is storage for a water bottle and a docking station for an MP3/Ipod device that plays through high fidelity speakers. Warranty is well above average, lifetime on the frame and brakes, 5 years on parts and electronics and 2 years in home labor. 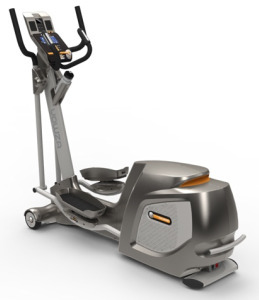 The Navarre from Yowza is a very well configured and quality built elliptical trainer, with features often found on more expensive units. If the Yowza Navarre elliptical trainer is in your budget range, it should be very high on your list.